Suppose the data entered in the textarea is to be displayed back onto some other page. Or the data is to be passed to another page through query string. As you might have guessed if this data is used as it is (without encoding) it can pose a security risk to the website. And therefore you should always encode it before sending it to any page. The form tag helper sets the asp-action and asp-controller attributes to Process and Home respectively indicating that the form will be handled by the Process() action of the HomeController. You will store the un-encoded value in ViewBag.UnencodedData property and the encoded value in the ViewBag.EncodedData property. This way we can display both for our testing purpose. The un-encoded value is outputted in the textarea. 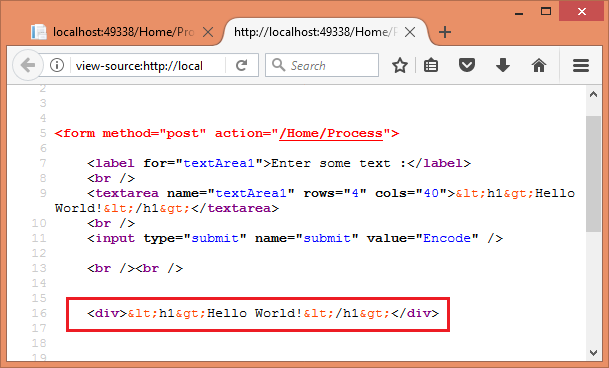 Assuming that we have HTML encoded the data the <div> element outputs the HTML encoded value. Why did we use Html.Raw() in the code? That's because the Razor engine automatically HTML encodes whatever you output using @ syntax. 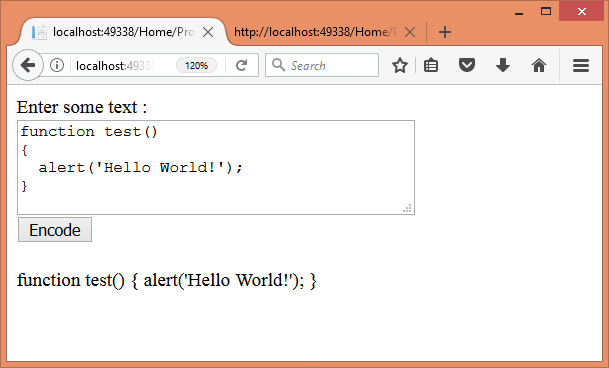 Here, we want to see whatever has been passed from the controller without any HTML encoding. And hence we used Html.Raw(). The code retrieves the value entered in the textarea through model binding (textArea1 parameter). It stores the un-encoded value in the UnencodedData property of ViewBag. It then uses the HtmlEncoder object and encodes the value using its Encode() method. The HTML encoded value is stored in the EncodedData property of the ViewBag. 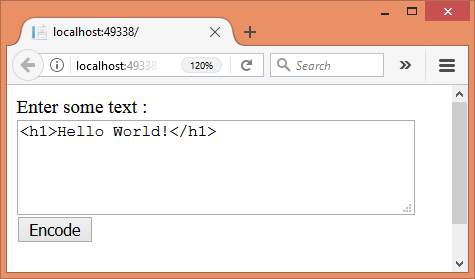 As you can see, the textarea displays the original HTML markup whereas the <div> element displays its HTML encoded equivalent. The code is quite similar to the previous example. But this time we used UrlEncoder object's Encode() method to URL encode the data. 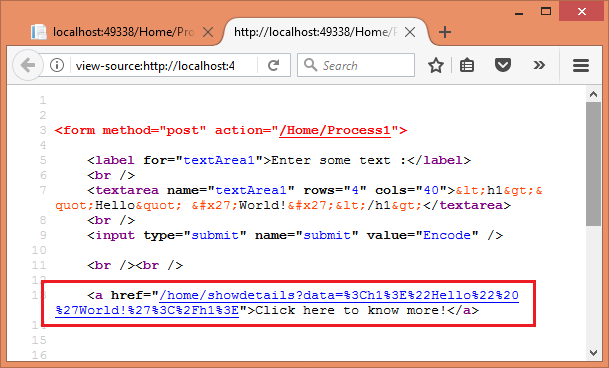 Now the value properly URL encoded and is safe to pass in query string. 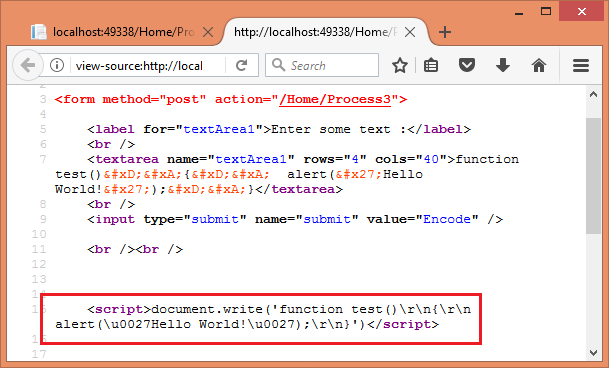 This time we outputted the EncodedData in a <script> block using document.write() method. To know how these encoders can be used to prevent cross-site scripting attacks go here.